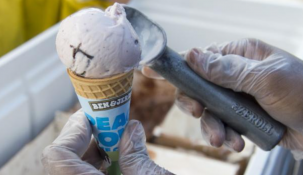 Another Fun & Flavorful Ben & Jerry’s Free Cone Day for the Books! Ben & Jerry’s at The Village Shops made Tuesday a treat! By 11am, the parking lot filled and guests were ready to take part in the 2019 Free Cone Day. Literally speaking, nothing could rain on the parade, especially when it came to receiving a free cone of any one of the 30+ delicious flavors at Ben & Jerry’s. Word got around quickly and the doorbell continually chimed as guests from all around town headed into Naples’ only Ben & Jerry’s. Inside the scoop shop, the full staff was on hand rapidly completing orders and sending guests on their way to enjoy another annual Free Cone Day! The Free Cone Day went on all afternoon and evening, from 12-8pm, serving the shoppers, diners, and all others that passed by. With a treat so sweet, everyone headed by the Bay for a seat. The benches around The Village Shops filled and there was nothing but silence as guests took in the views and savored the flavor. 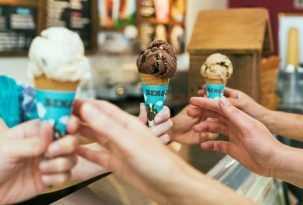 Ben & Jerry’s has been celebrating Free Cone Day since 1979 as a way thank their amazing fans for another year of support. Thank you to all who came out and celebrated the 2019 Free Cone Day. We look forward to seeing you again next year!